All transactions are safe and secure with a reliable history in online purchasing behind each of our associates. Buy the People Lie. Evidence Doesn't. 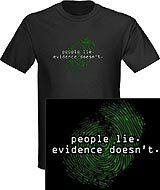 t-shirt to own CSI clothing and merchandise. In the CSI Las Vegas episode "Crate n' Burial" from season one, supervisor Gil Grissom (William Petersen) offered a memorable quote, "I tend not to believe people. People lie. The evidence doesn't lie." This Gil Grissom quote went on to become one of the main themes of the TV show; always trust the evidence. This CSI Las Vegas t-shirt is available in a variety of colors and styles. Wear it with a CSI hat. In addition to the People Lie. Evidence Doesn't. tee above, browse the CSI Clothing Gallery for more apparel like men's and women's clothes, kids shirts or hoodies.